One day, I suddenly had the urge to watch Cecile Licad perform. I don’t know why she suddenly popped into my mind. All I know is that one minute I was thinking about her, and the next minute I was searching online if 1) She’s actually in the Philippines, and 2) If she’s going to perform anywhere any time soon. 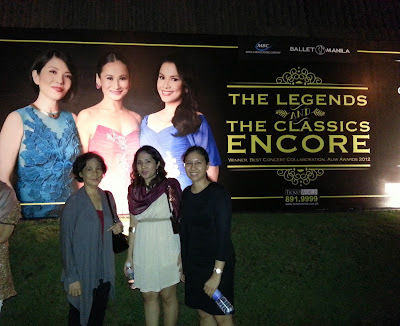 I soon stumbled into Ticketworld about her upcoming concert, The Legends and The Classics Encore, with fellow multi-awarded, internationally recognized Filipina performers, Lea Salonga and Lisa Macuja. I know my parents also want to watch them perform, so I started begging them to watch the show with me. Since the show is scheduled for 8PM, I needed a safe ride to and fro CCP. Luckily, my parents and sister agreed to watch it with me. 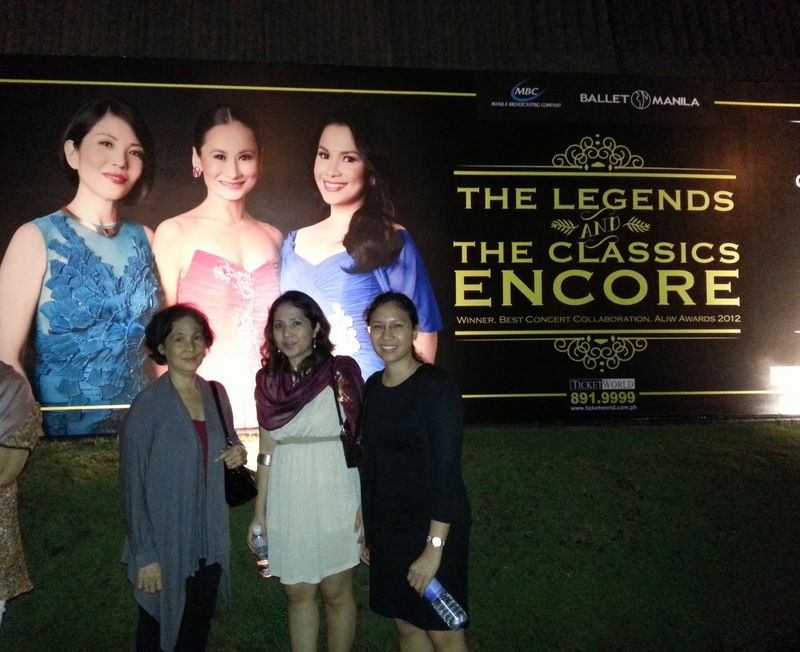 I was so excited, especially since I’ve never seen Lisa Macuja perform as well, and she’s retiring this year already! It was my last chance. Due to the death of my uncle last week, my dad flew to Davao, so we had one extra ticket. With some time management, we managed to get my eldest sister, ate Apple, to free up her schedule and watch with us for free. Since watching The Phantom of the Opera from the balcony seats (it was one thing I sorely regret until now), I have decided that I will watch future shows somewhere closer to the stage. Because the tickets were a bit pricey, my parents and ate Mako only wanted to get the lower balcony seats, which cost P2000. I then offered to upgrade our seats to Upper Box seats instead, which was my hitting two birds with one stone moment: ate Mako and I once pledged that we will watch a show in the Upper Box seats, and I’m now nearer to the stage. Hurrah! My mom said that instead of paying P6000 for my ticket and their upgrades, I should just purchase the P6k orchestra seat for myself, but I thought, where’s the fun in that? I’m glad I chose to upgrade their seats instead. It was truly a night to remember! First, because having our own box was just fun. There are six seats per box but the two seats remained vacant throughout the whole 2.5-hour continuous performance. My mom had quite a jolly time switching from seat to seat as she tried to find the seat that would enable her to see the stage the most (we’re all pretty fun-sized). Second, it was incredible seeing all three spectacular stars in one show! Us four were just in awe the whole time, listening to Lea’s amazing voice, and we were entranced by Cecile’s total performance on the piano, and Lisa Macuja’s emotion-inducing performances. I’ve seen Lea before in Miss Saigon (we won orchestra F6 seats! ), so I already know that she’s an incredible performer. But it was such a treat to see Cecile Licad, oh I can’t even describe how much! I recalled my music teacher in college once told us that if we ever have the chance to watch Cecile Licad’s performance, we should do so because she’s truly something. Cecile Licad just intrigued me. She looked like this awkward, beautiful, soft woman (and sometimes, she seemed unsure if she should join the two other ladies at the center of the stage), but as soon as she sits down, by golly, she transforms into something else. As she played, her fingers racing across the keys of the piano, she would look at Gerard with huge eyes, as if daring him to battle with her. You can see her (well, I was aided by binoculars the whole time) say “pam pam pam pam” as she pressed on the keys. And no matter how she hard or scary she looked like while performing, the notes sounded so melodious. And after the performance, it seemed like all that confidence would just drain away and she’d be this awkward woman once more. She seemed so shy, but put her in front of the piano and you cannot find a more confident pianist. There were times when I would just sit back, relax, close my eyes, and simply listen to the music. At that moment, while listening to Cecile Licad perform, I truly felt that music is one of the greatest blessings in life. Watching Lisa Macuja was like a dream come true. I’ve always been interested in her, more so since I watched Giselle, and I just kept imagining how it would be like to watch her perform. She seemed so lithe and she made it look so easy, spinning on her toes and doing all those leaps like she weighed nothing. It was enjoyable to see her end each of her performances with a proud and strong lift of her arms like the letter V. The most surprising treat was when she danced the swan song from Swan Lake, one of her most famous performances. I wanted to cry when I realized I will never see our very own (and sole) prima ballerina take to the stage as the black swan (or even the white, cause she’s awesome like that). Lea, Lisa, and Cecile only performed together a few times, to a few popular Filipino songs (at least popular to the older generation). As I mentioned, it was a continuous 2.5-hour performance. I didn’t time them but each star had her time to shine without overshadowing the other. I didn’t feel like I wanted to see more or less of one of them, which speaks for the good management of the show’s director. It was so energizing to see all three of them on stage. Lea, despite just standing by the corner most of the time, could certainly hold her own and project a presence even without moving much. I enjoyed hearing her lilting voice. My mom was very happy when Lea sang one of her favorite songs, Memories, from the Cats musicale. Lea performed songs from her various Broadway roles, and I was so happy that even if I never got to see her perform in all her shows, I was still able to hear her sing her pieces. I’m so grateful that I received so many blessings this year – and getting to watch The Legends and the Classics Encore is definitely one of the best so far.